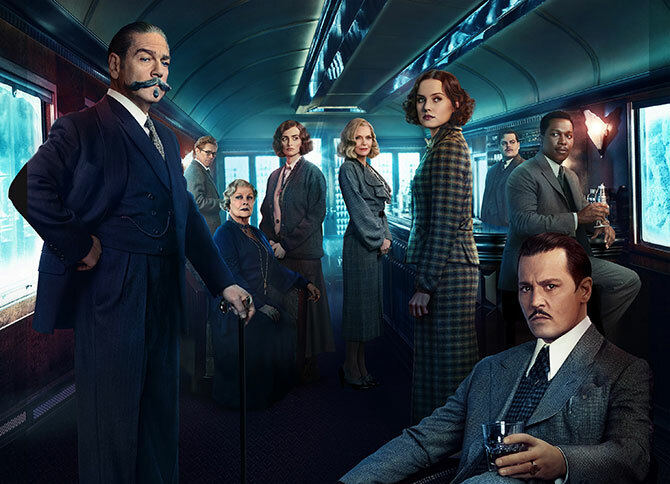 Murder On The Orient Express offers intrigue worthy of Hercules Poirot's investigation and our time, feels Sukanya Verma. Dame Agatha Christie is a hallowed figure in my home. Not one unkind word will be tolerated against her. But I am not the source of this bias. One of my earliest childhood memories is unsuccessfully trying to pull away from the hands of her biggest fan -- my mother -- a copy of the Christie mystery, Appointment With Death. Although I've read a few of the bestselling English author's crime novels and enjoyed Margaret Sutherford and David Suchet's portrayals of her celebrated detectives, Miss Marple and Hercules Poirot, I cannot claim to be a fangirl like my mom. Nevertheless, Sidney Lumet's Oscar-nominated (it won one for Best Supporting Actress) adaptation of one of the writer's best works, Murder On The Orient Express (1974) is staggeringly strewed in its manipulations and ingenious in its finish. 'No clear clues to follow and everyone's a suspect and innocent at the same time,' is how my mother always describes it. Naturally, I was rather curious to see Kenneth Branagh's take on the murder mystery as both detective and director. Lumet's version is doused in charm, cunning and spry wit. It is unequalled and gratifying no matter how often one revisits. If Branagh is burdened by this realisation, he doesn't show (The final scene suggests he's gotten quite comfortable in the role). Rather, his attempts to lend a famous, familiar premise its individuality and scale in creatively composed shots are commendable, if not completely helpful. Murder On The Orient Express isn't a typical whodunit and a part of its pleasure lies in the dialogue and scrutiny it invites across characters belonging to varying social strata stuck in a stately yet increasingly suffocating ambience of a stalled luxury train. Suspense not sensation fuels its setup, a ploy that has all the advantage on paper but demands movie star magnetism and vintage glamour to entice on silver screen. Like Lumet, who furnished the frames with a legendary cast (Albert Finney, Ingrid Bergman, Lauren Bacall, Sean Connery, Vanessa Redgrave), Branagh spearheads a starry line-up featuring everyone from Judi Dench to Johnny Depp. Branagh's Poirot sports better hair and a bigger moustache, but his Shakespearean eloquence clashes with his Belgian transformation. He's also the most sentimental Poirot probably ever got -- sighing at the image of what appears to be a long lost romance, giggling like a school girl over the contents of A Tale Of Two Cities and wistfully reflecting over the fractured human soul. All those trademark fair and fastidious qualities are still there but his intense quirks and loathing for 'imbalance' are toned down to fashion a Poirot whose heart is as active as his little grey cells and one who's smugly aware of his pop culture significance. You simply cannot question his effortless deductions of complex crime scenes. The kind that transpire when you're on board the plush and packed Orient Express, traveling from Istanbul to London, stranded in the snow-covered Yugoslavian landscape following an avalanche. Apart from the sleuth, passengers include Penelope Cruz as a god-fearing Spaniard, Willem Dafoe's haughty professor, Daisy Ridley's affable governess, Johnny Depp's shady art-dealer, Josh Gad's skittish secretary, Derek Jakobi's unusually accommodating valet, Judi Dench's uppity Russian princess, Olivia Colman's anxious caretaker, Leslie Odom Jr's soft-spoken physician, Tom Bateman's dynamic in-charge and Sergie Polunin and Lucy Boynton as the secretive Hungarian diplomats. Everyone's splendid and tailor-made for the part but Michelle Pfeiffer's impetuous, boisterous and meddlesome wealthy widow stands out for her gumption. En route, one of them is brutally stabbed to death and Poirot is commissioned to figure out who did it. Individual interrogation of the suspects and startling discoveries about the victim mark the pursuit of killer, whilst clubbing the murder to a previous crime. Often the sluggish, digressing pace of these procedural interactions dulls the buoyant mood it worked towards. Another downer is Murder On The Orient Express offers a rather cursory understanding of the motives that justify its unique climax.